I’ve always found it fascinating to read about what ex-politicians get up to in their own time once they’re no longer in the spotlight (although, it appears you can’t even spend a measly £25k on a hut without someone writing an article about it). I tapped on the title and read the article. 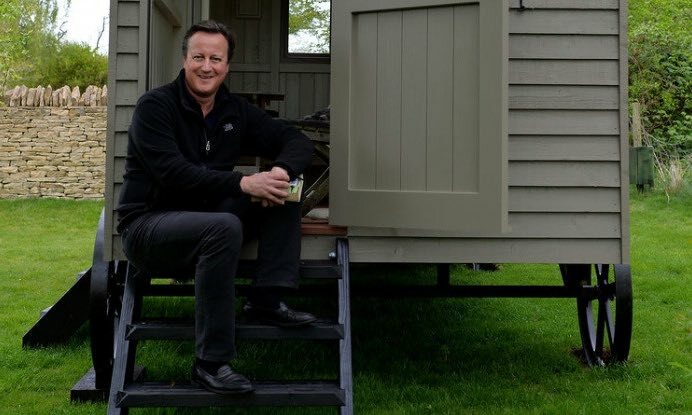 Turns out, David, with the help of his wife Samantha, bought a really nice bespoke shepherd’s hut for his garden, which he’s going to use to write his memoirs. It’s got that fancy Farrow & Ball paint that you see in B&Q but never buy because paint is paint, right? It’s also got Bakelite light switches and hardwood stable doors. Turns out that, just like us mere mortals, David Cameron also googles things! The company who create the shepherd huts are called Red Sky Shepherds Huts, which is owned by Paul Bennett. Their website is a very nice example of how to effectively use white space to your advantage. It’s clean, modern, attractive and is designed perfectly to entice their target market. It reflects the brand and values of the business. It appeals to the businesses’ target demographic. It is clear, easy to use, with anyone being able to find what they’re looking for in just a few clicks. Most businesses will get it right with the first point. They’ll want to make sure that everything is on-brand and reflects what their business is all about, which is great! But unfortunately, points 2 and 3 get ignored more often than they should. Point 2 relates to how your online presence should be portrayed, depending on your target demographic. If you’re a highly professional, corporate business providing government equipment, your website and its’ content is going to be very different when compared to your local yacht club’s website. Point 3 relates to user experience, or UX. Websites should have certain fundamental functionalities such as being mobile responsive. They should also consider what the majority of their website visitors will do (or intend to do) when visiting their website. If you’re a local mechanic, it’s likely that most people are simply looking for your phone number, or a way to book an appointment with you. If you’re a magazine, a visitor could simply be looking to read some articles, or set up a subscription. These core elements should be first and foremost when designing a website. But I digress – let’s get back to Mr. Cameron. The other important point about this story is that Red Sky Shepherds Huts were found by David Cameron on Google. As of 30/04/17, they sit in 2nd position for the Google search term ‘shepherds huts oxfordshire’. Their SEO, however minimal or expansive it may be, is working for them. And I wouldn’t be surprised to see them jump to the top spot in the coming months. Their website and their SEO. I do like a hut. And as for Farrow and Ball paint …my old flat was decorated with it. 20 shades of white. Lovely but it’s chalk based. One dirty finger mark and you’re repainting!!! Intersection article by the way! Where do you stand on huts? Do you like huts? Perhaps you own a hut? We would love to hear your thoughts on huts, as well as web design & SEO.